Three time GRAMMY Nominated composer/arranger Frank Macchia continues to explore the world of traditional folk songs in a new collection of twelve folk songs twisted in all new ways by his all star band of Los Angeles musicians, including Wayne Bergeron, Peter Erskine, Grant Geissman, Michael Hatfield, Trey Henry, Alex Iles, Valarie King, Sal Lozano, Jay Mason, Kevin Porter, Tom Ranier, Bill Reichenbach, and Bob Sheppard. The new CD also features guest vocalists Tierney Sutton and Ellis Hall and the styles range from R&B, Swing, New Orleans second line, Latin, Ballad, and Odd metered craziness! This CD is the follow up to the highly acclaimed Folk Songs for Jazzers which garnered Frank a GRAMMY nomination for his arrangement of "Skip To My Lou" and also received "Top Jazz CDs of 2010" from DownBeat Magazine, as well as Critics Choice from JazzTimes Magazine. Welcome to volume two of my exploration of folk songs and their reinterpretation through jazz. I really felt that there were so many more tunes that I hadn't dissected that I wanted to continue the process I started with Folk Songs for Jazzers and get these ideas out of my system! We open with a version of Twinkle Twinkle Little Star that starts with a lush ballad and transforms into a latin-tinged opus that features the whole band. The woodwind solo trades are Valarie on piccolo, Sal on flute, Bob on clarinet, Jay on soprano sax and myself on alto clarinet. Out of the solos emerges a soil that has every nursery theme I could fit in 16 bars! Then Grant and Tom trade fours followed by Trey's bass solo. Each of the brass get a solo, Wayne, Alex, Kevin and Bill, followed by a drum break and last but not least some flying marimba by Mike near the end. This nursery rhyme is based on the French melody "Ah! vous dirai-je, Maman" which dates to 1761. Careless Love is an old traditional song of obscure origins and has been covered by numerous jazz, blues and country vocalists. As soon as I thought of this song I visualized Ellis Hall singing, as I knew he could bring a new level of emotion to this song. Check out Grant's tasty guitar throughout and Bob's brilliant opening on tenor sax. I had two different ideas with Three Blind Mice, so I decided to do both for this project. This first, Three Jazzy Blind Mice, is a feature for Tom Ranier on the piano and is done as a fast jazz waltz. This song dates back to 1609 and there is speculation that the lyrics refer to Queen Mary I of England blinding and executing three protestant bishops! It entered children's literature in 1842. Probably the most challenging piece in this collection is Itsy Bitsy Spider, a simple 8 bar nursery school song which was published as early as 1910. This version is played by the brass over a 15/8 metered groove, then features solos by Bob on soprano sax and Alex on trombone. Peter kicks the band and solos, bringing us back to 15/8 and the theme out. You might interpret the ending as a "spider squash"… who would I be to disagree, but no spiders were harmed in the recording of this song! Work Songs is a medley of two slave songs that were sung during the 19th century in America, primarily in the southern states. I feel these songs are in some ways the predecessors to most blues and jazz tunes as they are incredibly joyful and exude a driving chant and rhythm that just gets under your skin. I feel this music is the epitome of the human emotional experience and how music can spiritually transcend even the most horrible of situations. The song Pick a Bale of Cotton is such an incredible example of this- the lyric is that the person is going to pick a bale of cotton a day, which was an impossible task for one person, yet the exuberance that the song has seems to take the painful task of picking cotton (which made your hands bleed!) and turning it into a joyous dance tune. The same goes for Shortnin' Bread. What these songs have are deep blues riffs that build and build. I think this is what Charles Mingus was doing with a lot of his incredible blues-riff chant compositions. Tom is featured on piano and Frank and Bob trade sax solos. Peter lays down a deep second line groove! First published in 1907, Silver Dagger is an American folk ballad whose roots trace back to 19th century British Isles. It's also known as Katy Dear, and is about turning away a potential suitor. Tierney Sutton sings this with such beauty and quiet intensity. The song has been extremely re-harmonized, using woodwinds and baritone horns in lieu of traditional big band saxes and brass. Three Cool Blind Mice is a medium swing finger snapper, and features five bass flutes in harmony and plunger mute brass. It's my impression of Johnny Mandel and Duke Ellington collaborating on a tune! This features Valarie on bass flute solo and Grant on the cool guitar solo. The medley Cindy-Li'l Liza Jane merges two very similar styled songs into one big band extravaganza. I think I heard these songs originally as a child on the Andy Griffith Show and in fact Cindy originated in North Carolina. Li'l Liza Jane was featured in the 1916 show "Come Out of the Kitchen". Our version starts off with Peter doing the "Sing Sing Sing" style drums and then gallops off to a bass trombone solo by Bill, an alto sax solo by Sal, a Duke Ellington meets Jimi Hendrix interlude followed by Grant's screaming guitar solo. Then Peter puts us into high gear and we zoom into Li'l Liza Jane with an epic duet by Bob and Peter, followed by a trumpet solo by Wayne, which literally broke glass! The "take-it-on-home" ending is an old time favorite of mine. I hope you don't mind the indulgence! Frankie and Johnny tells the story of a woman, Frankie, who finds that her man Johnny was with another woman and shoots him dead. She is the arrested and in some versions executed. Yep, another sweet folk song!! This version features Jay Mason on baritone sax and Kevin Porter on trombone with cup mute. My good friend and extraordinary trombonist Alex Iles is featured on this dark version of Billy Boy, a folk song and nursery rhyme. Check out his cadenza near the end where he plays the song using multiphonics, a technique where you sing one note and play another; it can cause very interesting harmonies to form and Alex has done this ingeniously. There's funny side note to the lyrics in this song: Billy is seeking a wife but she keeps telling him she's too young, however in the last verse the lyrics state: "How old is she, charming Billy? Three times six and four times seven, twenty-eight and eleven". It's either a math puzzle or the woman is older than the protestation of her youth in earlier refrains! The English children's song This Old Man was considered a counting song for kids and dates back to 1906. I took on the vocal on this , summoning up my version of Tom Waits, probably after drinking some turpentine! Trey gets to hold forth on the beginning and end with a bluesy bass solo, Kevin does the wailing trombone solo, Wayne wails on trumpet and check out the bass clarinet/bass soil in the middle. Bob on bass clarinet, Sal on contra alto clarinet and Jay and myself on the big ol' contra bass clarinets, with Trey on bass. I like the low notes! Ending up the album is the Boating Medley, which features the songs Michael Row Your Boat Ashore and Row, Row, Row Your Boat. We start off with a cool swing feel and I do my best Gil Evans impression of the melody voiced for 9 horns, then Bill takes a bass trumpet solo, followed by a vibes solo by Mike. Peter kicks up the groove to my favorite New Orleans second line feel and we do a four part canon on the Row Your Boat theme, followed by Bob's tenor sax solo. When the melody kicks back in, we have a duet of Michael and Row Your Boat at the same time, racing towards a big finish with a sailing quote from Valarie on piccolo. Interestingly, Michael Row Your Boat Ashore is an Afro-American spiritual sung during the American Civil War from South Carolina, sung by former slaves whose owners had abandoned St. Helena Island before the Union navy would arrive to enforce a blockade. Row, Row, Row Your Boat dates back to 1852, but the "modern" version that we know is from 1881. Tierney Sutton- vocals, "Silver Dagger"
Ellis Hall- vocals, "Careless Love"
Tierney Sutton had a cameo appearance during a marathon two-hour set by Frank Macchia's big band. Macchia, a witty arranger and a good-humored band leader, had a record release party at Vitello's for his CD Son Of Folk Songs For Jazzers, which naturally followed the previous Folk Songs For Jazzers. While his big band consists of 14 pieces, they play around 60 instruments, allowing Macchia to feature everything from five piccolos to three baritone horns. Every musician had chances to solo along the way including Wayne Bergeron (the band's only trumpeter), tenor-saxophonist Bob Sheppard, flutist Valerie King, bass trombonist Bill Reichenbach, pianist Christian Jacob, guitarist Grant Geissman, drummer Peter Erskine (who found it difficult not to smile and chuckle during some of the charts) and trombonist Alex Iles. The concept behind Macchia's band is that they perform vintage folk songs that everyone knows, but in unusual and often very abstract ways. The set included such unlikely material as "Twinkle Twinkle Little Star," a classic reworking of "I've Been Working On The Railroad," two versions of "Three Blind Mice" (including one that featured five bass flutes), "Skip To My Lou," a rambunctious "The Erie Canal" (which featured bass sax and tuba, often with the backing of piccolo, clarinet and flute), "Did You Ever See A Lassie," "Lil' Liza Jane," and "Michael Row Your Boat Ashore." A highpoint was Alex Iles' trombone playing (which included a very funny use of multiphonics) on a humorously dark version of "Billie Boy." Tierney Sutton sang "Red River Valley" and "Silver Dagger" while vocalist Ellis Hall recalled Ray Charles a bit on "Careless Love" and "Amazing Grace." Both of Frank Macchia's unique big band recordings are well worth picking up. 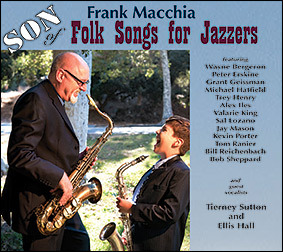 Saxophonist Frank Macchia keeps racking up the Grammy nominations. He got his third nod for the award with his big band interpretation of "Skip to My Lou," from his Folk Songs for Jazzers (Cacophony, 2010), following up his recognition for Emotions (Cacophony, 2007) and Landscapes (Cacophony 2008). In addition to his work in producing these excellent CD offerings, Macchia also works extensively in film and TV, as one of those musicians many have heard without knowing who it was they were hearing, on television shows including Lost, Desperate Housewives and Murder She Wrote, as well as over forty big screen movies. On the jazz side of his career, he's on a roll with his reinventions of familiar traditional tunes, offering up Son of Folk Songs for Jazzers. This may be the only jazz CD ever to open with "Twinkle, Twinkle Little Star," and it does so with rich majesty. Macchia is a master arranger. The tune begins with a panorama of reeds, stars blinking on in the night sky on single, succinct piano notes, before the tune shifts into a danceable Latin groove. Macchia takes things into the dim streets and smoky back rooms with "Careless Love." The arrangement staggers, wobbles and wailsm as Ellis Hall sits in to contribute a down-low vocal that bumps up against the tangy sting of Grant Geissman's bluesy electric guitar. On "Silver Dagger," an American folk ballad traced back to the 19th century British Isles, vocalist Tierney Sutton guests, her voice suffused with a charming guilelessness, immersed in a gentle, reedy arrangement that circles her like a spirit wind. "Billy Boy," a tune which gets covered in jazz more often than the others here, features Alex Iles's stately trombone declarations, that devolve to growls and rasps, augmented by the dark, dense turbulence of Macchia's arrangement, which gives the tune a very ominous mood. The storytelling mode, from the dark side, continues with "Frankie and Johnny." Jay Mason's wandering baritone sax and Kevin Porter's trombone tell the tale inside the shifting breeze of Macchia's shadowy arrangement. Macchia's done it before, and he does it again, serving up an unlikely bunch of traditional songs for a jazz treatment, infusing them with Latin vibes and funk, New Orleans swing, and big band grandeur, all with energy and uncommon style. .